Last month, we offered a pre order discount on this limited edition Code Black to Lifehacker readers. It sold out in 3 days. 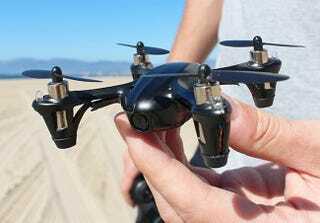 Luckily, we brought it back, so you can get a pre-order discount of 55% off a Code Black Drone + Free Shipping. Want to get in on the drone craze? This is a good place to start. Note: This is a pre-order – the drone will will ship in early February. You'll receive a confirmation email now, and tracking info when it ships.